Dust mites are domestic parasites belonging to the arthropod family. Their habitat is dust, and the source of food is dead cells of human skin. Dust mites are unpretentious and can survive in almost any conditions. The most favorable environment for their living is warm and humid, the temperature – about 21 degrees of heat, that is the one that is installed in residential premises, an abundance of food (epithelium). This explains their wide distribution. Such parasites can cause allergies, and their prolonged exposure to humans can lead to the development of sinusitis and even asthma. Besides, tick provokes a disease such as scabies, that occurs during regular contact with the products of its vital activity. That is why it is important to know what a dust mite looks like that lives at home, and how to get rid of it. Household mites are dangerous not only bites. Their feces also negatively impact the condition of humans and domestic animals. Dust mites are invisible when viewed with the naked eye because their length reaches only 0.5 mm. To study the details of the structure of his body is possible only with a microscope. One gram of house dust can contain from hundreds to thousands of parasites. Tick this type, as well as all spiders, has flattened body shape, consisting of interconnected individual segments. It moves with eight legs. There are suckers on each limb, thanks to which the harmful microorganism is firmly attached to the surfaces. With the help of two pairs of jaws, the parasite captures and grinds food, and also pierces the skin of the host, as some mistakenly believe. The body of dust mites covered a kind of water-repellent layer. If we look at the parasite with a microscope, we can notice that it looks like an ordinary small spider. 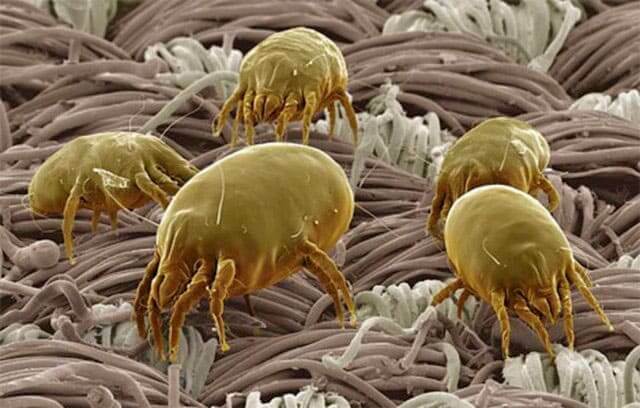 There are about 150 species of mites that live in house dust. According to statistics, in bed is the largest number of parasites: here you can find up to 2 million individuals. On the occurrence of allergies provoked by mites, indicate such signs as frequent sneezing, the appearance of wheezing in the chest, choking cough, tearing, redness of the eyes. This disease is diagnosed based on data collection, blood tests and microbiological tests. Treat dust mite allergies by limiting patient contact with allergens, the use of medications, and desensitization. These are measures aimed at reducing the body’s perception of allergens. For these purposes, an allergen extract is administered to the person, gradually increasing the dosage and concentration. With the help of desensitization, the body does not react so strongly to the source of irritation. The destruction of bed mites is a radical measure. In order not to resort to it, you can make an effort and regularly produce some activities. They will help prevent the likelihood of their uncontrolled reproduction. Pay attention to the temperature in the rooms: it is desirable that it was not too high and does not exceed 22 degrees. However, not always to get rid of allergens, you need to make sacrifices in the form of getting rid of half of the furniture, curtains and carpets, it is not always necessary to buy a lot of expensive and space-consuming technology. Simply purchase a powerful multifunctional cleaning system that will cope with the cleaning surfaces and air almost 100%.